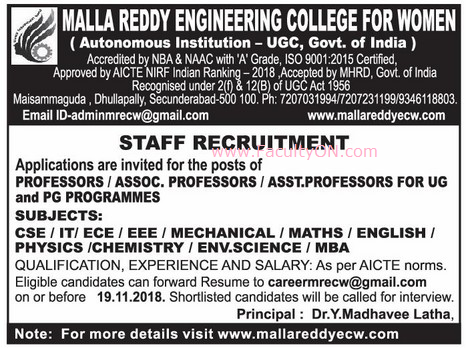 Malla Reddy Engineering College for Women, Secunderabad has advertised in the EENADU newspaper for the recruitment of Professor / Associate Professor / Assistant Professor jobs vacancies. Interested and eligible job aspirants are requested to apply on or before 19th November 2018. Check out further more details below. About College : The college offers B.Tech Programmes in ECE, CSE, EEE & IT, M.Tech Programmes in Embedded Systems & VLSI Design, Embedded Systems, Computer Science Engineering and Computer Science and MBA. More than 80% of the faculties are ratified by JNTU HYDERABAD. MRECW emphasizes on Application Oriented Teaching & Problem Based Solving. Since the establishment of the college it is known for academic excellence. In collaboration with Globerena Technologies Pvt. Ltd & Time Institute, the College offers Pre Placement Training Programs, e-learning & Training, e Assessment, Career Connect and Industry Connect Programs.Most of the MRECW students were placed in reputed MNCs like IBM, L&T IES, NTT Data, I Gate, HCL, Amazon & Genpact. How to Apply: Interested and eligible candidates are requested to forward their updated CV, copies of certificates and a recent PP size photo to the following email address. Shortlisted candidates will be called for interview.